An insightful and intimate look at the last all-male military college’s struggle to prepare for and assimilate women into its corps of cadets. Laura Brodie introduces herself to her readers as the wife of the Virginia Military Institute band director; she then adds that she is a feminist with a PhD (in English) from the University of Virginia and served on one of the oversight committees for the integration of women into VMI’s corps of cadets in 1996. The tension of producing an intellectually honest history of the military university’s growing pains while simultaneously being a full-fledged member of that institution’s “family” could have turned this book into an empty panegyric to VMI’s martial subculture. Instead, Brodie harnesses that tension to evoke the deeper cultural currents that underlie the integration of women into traditional male strongholds. 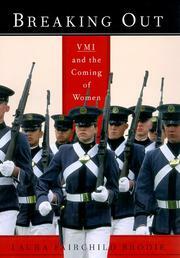 She traces VMI’s dedication to assimilating women and its discomfort with addressing the practical problems of facilities, cadet slang, and physical fitness tests with balanced and humorous anecdotes: her narrative of the women’s edgy reception, their demanding training, and the identity issues with which they struggled during their transformation into VMI cadets is equally engaging. The very intimacy that lends the book its authenticity also produces its limitations, however. Brodie downplays the societal implications of VMI’s integration in order to deeply explore its effects on the college’s unique fraternal culture. Even so, Brodie’s insider awareness of the outlandish textures of VMI’s culture, and her exhaustive interviews of cadets and faculty create a solid oral history which offers a unique point of view on the struggle to assimilate time-honored traditions with progressive values. An engaging oral history that offers a snapshot of how far American military culture has come in accepting women and suggests the complexities involved in the nation’s continuing struggle with issues of gender and the military.